I have always been a DIY'er and frequently find myself working on a variety of projects for myself or assisting friends. I have a lot of projects lined up this year, we moved into our new house that needs extensive updating, upgrading, remodeling and landscaping late last August. I also do small engine and equipment repairs, automotive repair and fabrication, and much more. Sometimes I'll try and teach, I'll ask questions and learn, I might humble brag or tell you what not to do from time to time. I will be providing photos of progress and links to any reference material used when applicable. I will also keep the OP updated with links to posts of projects and adjust the title after the colon for the most recent updates. This threads intent is to be my man diary of mostly manly things. However, don't judge me if I do a sewing, baking or crochet segment because those are manly things, too. Next time I cut a Ford Ranger in half and use a tractor and a dozer to lift up the halves and back a utility trailer under it I'll make sure I get pictures and video. Here is the list of links to posts of projects. Being that I typically have more than one project going on at a time, multiple links may be provided for ongoing projects. I've been planning my garden for a few weeks now but am looking for more ideas. Here is a picture of my house. 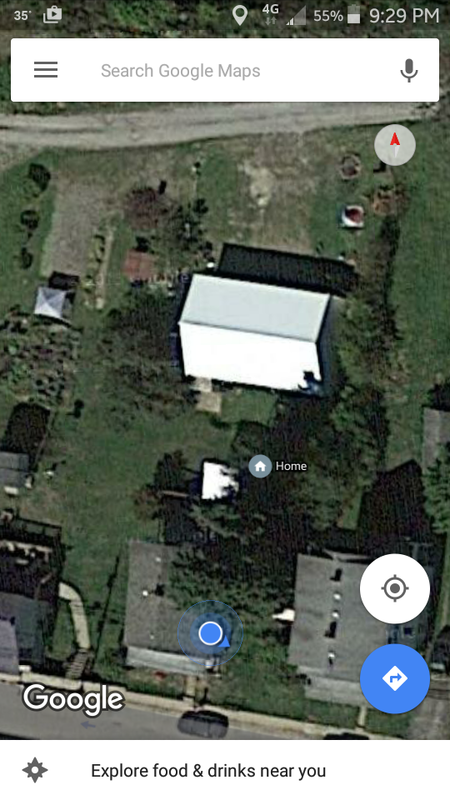 For a frame of reference, the garage is on the north side of the property at the bottom of the slope and the house is on the southern side of the property at the top of the slope. Note: Google recently flew over because the pile of mulch on the NE side of the property has only been there since late December. I want to put a 4'x20x12" raised bed that runs parallel to the parking area behind the garage on the west side. I'm not sure if I want to root veg or if I want to put up a trellis and do climbing and vine veg and fruits. I've already moved the burn barrel and placed it right next to my neighbors at the NW most corner. The NE corner is going to get 3 4'x16'x12" beds oriented E to W starting at the N edge of the property going S leaving 15' between the final bed and the garage. The N most bed will also have a trellis and the tallest plants will be planted in the N had with the shortest in the S bed. I also have plans for addition trellis on the S side of the garage and house. Outside of each had there will be a 6" tall and 6" wide bordering bed for various flowers that will act as a deterrent to vermin and pests. I'll get more in depth of what I am planting where and why once I get outside and snap a few more pictures with markets indicating borders and locations. From there I will MSPaint a diagram of what will be planted where and why with my reference materials. I am finishing the final stages of planning today and intend to start building by Friday. I'm looking at 272 square feet of garden and I'll be planting based off of the square foot method, not planting in rows. I'll be back shortly with photos and again later with diagrams. Strong like tractor, smart like tractor. Sorry we are all out of Aimless. We reserve the right to substitute a staffer of equal or lesser value. Where do you want your DK-Prof sent? I haven't forgotten about this thread but I have been rather busy with work and school, and the weather hasn't exactly been cooperative this last week. I do have my garden plans drawn up but it has to take a back seat; the wife's uncle is stopping by to visit today and letting me borrow his pressure washer so that I can stain the deck and clean up the house, garage, shed, tool room and sidewalks. I don't really consider this a DIY project, but I'll probably snap a few pictures and do a little write up anyway. Also, my coffee pot decided to quit on me this week. Now I could just replace the $20 appliance of I wanted to but I'd much rather try and squeeze another 5 years out of my $20 investment. Saturday I'll be going out to my private club to steak out my permanent camp off grid site. I'll get some photos, share my thoughts and get some insight from you guys. We'll have two offroad rigs so we might do some light wheeling while we're out. One thing that I didn't address in my OP is that I'm using this thread to practice my technical writing for a class that I'm taking next fall. Please feel free to be a grammar Nazi, to ask me to be more specific, or correct me if I use the wrong venacular. Anyway, I'll be back later. Yesterday I got a call about a check engine light, code P0404 EGR curcuit, on a 2010 JK. Since I'm still a little unfamiliar with the 3.8 I jumped on WranglerForum and found this, which has been an enormous help. My initial assessment was to remove the battery, battery tray, and start digging down to the EGR, but found that moving the air dam inside the passenger side wheel well was the best course of action. For the first time in my adult life I pulled all the plastic retaining clips without breaking any, and there were only two rivets on the rear of the fender flare that needed drilled to free the air dam. Once that's out of the way, if you look to the back of the block near the firewall you'll see the EGR. There were two 8mm bolts at both ends of the tube going from the head to the EGR and two stacked 12mm bolts that secure this tube and two vacuum lines in place. Now here is where things get difficult. First, if you have the automatic transmission (this JK did), your going to have to move your transmission dipstick tube to have the clearance to get to the last two bolts. You will need a S or crecent shaped obstacle wrench, a screwdriver but in 10mm, or be extremely creative because it is tight back there. I had an old ratchet with a slim profile that didn't actually have a ratcheting mechanism and I grinded down one of my 10mm sockets and I was just barely able to get on to the back bolt. Be careful here, there is an aluminium flange where the block and head meet and it tore my hand up pretty good. Throw a shop towel in there and enjoy. This is about when I wrapped it up last night. After I finish my coffee I'll be headed back down to the shop to finish up. I did decide to do the spark plugs since the Jeep is nearing 80k miles and had never had a change. The back passenger side spark plug is reached the easiest by removing the air dam I already have out, it sits just forward of the EGR and is a pain to get to otherwise. I'll be checking he owner also identified a small leak in on of the trasmission coolant lines. It's not bad but she wants to upgrade the system because she actually takes her Jeep off-road quite a bit. We're going to put this off for another week or two while we research recommended products. Last edit for now, but I'll be back later this evening with more pictures of what I'm doing, the parts and tools used. Plus there will be more on the dinner pic.